This is a major area that I hear a lot of people having issues with. Trust me! You are not alone! I have been there and it is frustrating to run around all day long and have nothing to show for it at the end of the day! It’s exhausting! 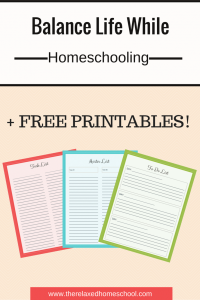 I want to share what has worked for me on my homeschooling journey so far. I use 4 different lists to keep me straight. I have a Task List, Master List, To Do List, and Daily Routine Task Cards. I know it sounds like a lot, but stick with me okay? 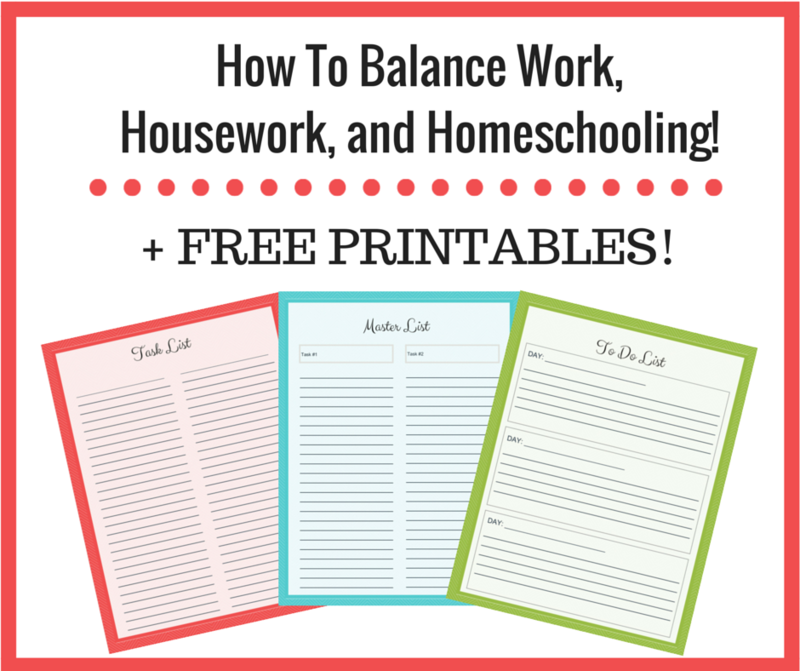 I also want to stress that giving your children regular household chores helps a ton! You can get some great ideas for that here. So I put all of the tasks that I want to have done in the next month or two on my task list. This is just a simple list where I just write a short description of what needs to be done. 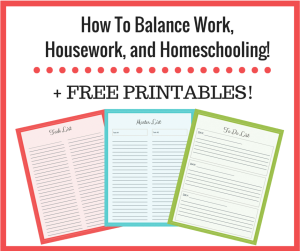 This helps me keep my work life, home life, and homeschool goals all straight. This list also helps get the ideas out of my head and on to paper so that I can stop stressing out about them so much. Amazing how that works! Next, I have my Master List. I pick out TWO things from my Task List and write them on my Master List. I only pick two because if I pick anymore than that I end up doing a little bit of this and a little bit of that…. and the quality of my work just isn’t where I want it to be. I also find doing more than two at a time takes LONGER to complete things. I have to many ideas rolling around in my head about each project so keeping things set at 2 at time works best for me. After you move TWO things to your Master List, you simply break each task down into small easy to achieve steps. Now you take your To Do List and move 2-3 of the small steps from the Master List onto your daily To Do List. Be sure to keep it reasonable! If it is grocery shopping day, then maybe only pick 1 thing to do from your Master List. The point of this is to focus well on the task at hand and get the work done right the first time so that you are not going back and re-doing things. I hate when that happens! *sigh* Anything that is not completed simply gets moved to the next day. Now on to your task cards. Decide what needs to be done in your house each day. Write each days list on it’s own task card. I split mine daily household chores into AM and PM. Then laminate them, punch a hole in the top corner, and add a small binder ring. Keep this hanging up in your kitchen. Mine is hanging on my key rack. My week looks something like this: Monday – Bathrooms, Tuesday – Bedrooms, Wednesday -Kitchen, Thursday – Guest Room/Work Room and Pets, Friday – Living Room, Saturday – Office, Sunday – Weekly Prep Day. My weekly prep day includes: Meal planning, washing bedding, any lesson planning or prep, and making sure the kitchen is nice and tidy. I usually do my grocery shopping on Mondays. So for my weekly prep on Sunday I will clean out the refrigerator and pantry. Toss out anything that is old or expired and make room for the new groceries coming in the next day. It helps things to go smoothly after a long day of shopping with kiddo! LOL! Keep extra copies of each sheet ready to go for when you need them. Just keep them in a simple folder and label it “Lists”. I personally keep my lists in here at all times. One side has my current lists that I am working on and the other side has my blank lists printed out and ready to go! I leave the folder on top of my desk so I remember to use it everyday, but you can keep this on your kitchen counter if you think this will help you to remember to use it. 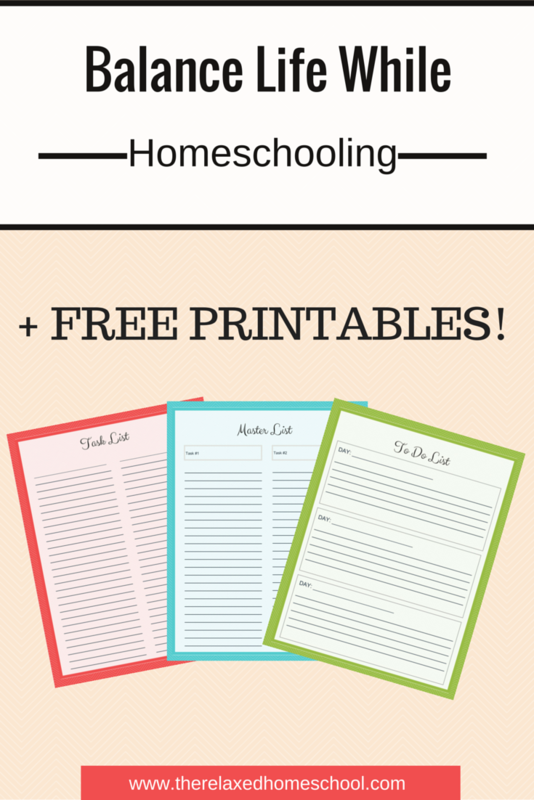 Download your organizing sheets here and give it a try! Organization Sheets. How to stay on schedule once and for all!